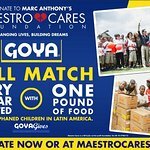 The Maestro Cares Foundation was launched in January 2012 by international pop icon Marc Anthony and entrepreneur Henry Cardenas to help children in need throughout Latin America. It is the goal of the Foundation to improve the quality of life for orphaned, abused and neglected children by providing them with basic needs and surrounding them with a safe and healthy environment to live, learn and play. Google trends for "Maestro Cares"
We don't have any videos related to Maestro Cares.